History of Persian Earthquakes: The Persian Empire was based in reality and origin on the Iranian platform. This in terms of geographical significance means that it was often on the receiving end of nature’s plight. The platform which in reality is a plateau is prone to many earthquakes and the empire was often set back by the earthquakes that followed. There were understandably large casualties and the empire that was almost always on a warpath had to consider growing inwards in the face of this destruction. This was a reality that they were ready to accept and had a great influence on their architecture which shows the telltale traces of earthquake protection in their engineering. This article is a recounting of some of the most noted earthquakes of all times on the Iranian Plateau. Some of the greatest earthquakes of their times occurred pointedly in Iran as it stands on a very fragile tectonic border. 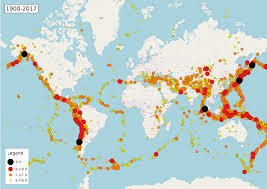 This makes earthquakes more common here than in other regions. Following is slightly a history of earthquakes in Persia. It is recounted as the worst of all the earthquakes that occurred in ancient Persia known to have caused extensive damage at its epicenter in Damghan. It is slightly after the Damghan earthquake and still another major recorded earthquake at Ardabil. Recorded at Tabriz this has written testimony as being highly destructive and taking down highly populated areas at places other than the epicenter. The destruction has been noted and from it, they have discerned that it could be something around 7.5 on an average. Having over 40000 fatalities in that time this earthquake was another major disaster to have happened in Iran. The epicenter was recorded at Kashan where the most damage occurred. At a Richter scale reading of 7.3, it was devastating, to say the least, and had a fatality list that was heart-rending, to say the least. At Pasni this was another 7 pointer on the Richter scale and has unknown casualties. The most recent of the Iranian earthquakes this was a 5.8 on the Richter scale. So here we have a fully formed timeline of some of the most devastating earthquakes on the Iranian plateau from the ancient times to the most recent. The main pattern that can be seen when looked up in detail is that there have no less than 10 earthquakes from 2002 to 2011. This shows how prone the plateau really is to tectonic disturbances. The repetitive earthquake occurrences in this area alone have made the people of this area more than wary of the earthquakes. This shows that a history of Persian earthquakes is more than filled to the brim with experienced engineers and an Iranian Earthquake Engineering Association has been set up in modern times to make stand guard and have the best precautions in case of such an occurrence again.